30% to 40% of the electricity consumed by many electronic devices is now lost just in converting conventional alternating current (AC) to direct current (DC). The major renewable energy technologies, photovoltaic solar and wind, produce DC power. DC-based options tend to be at the forefront of possibilities for local power storage. 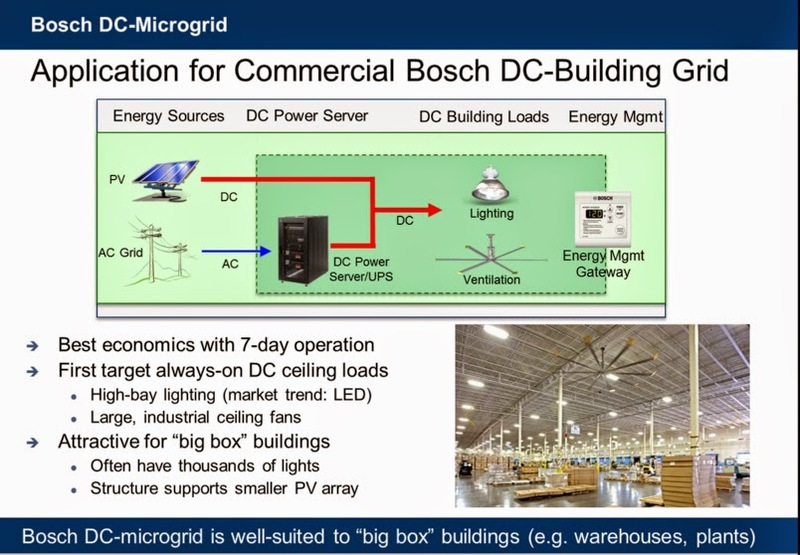 Microgrids, which produce, store and consume electricity locally, may be dominated by DC. Rapid charging of electric vehicls (EVs) with DC power is looking to be an important facilitator of EV acceptance. Another important trend has been the increasing importance of DC power within buildings This is especially true in offices for computers, monitors, servers and all of those other devices that have transformers. The transformers are those little bricks that convert the AC power coming from the outlet to the DC power that the devices require. These boxes feel warm to the touch because the conversion process is not totally efficient and some electricity is lost as heat. Today's power supplies with small transformers often have an energy efficiency of only 60 to 70%. In addition, lighting, the largest single use of electricity within buildings, is starting to move toward solid state technology. LEDs are DC powered devices and the conversion of AC line power to DC involves some power loss. The choice to use alternating current for the distribution of electricity was made in a heated conflict between the scientists Tesla and Edison around 1880. Tesla emphasized the practical advantages of alternating current. Transformers make it possible to easily increase AC voltage allowing power to be transmitted via cables over great distances with very little loss. With DC voltage, this was not easy to achieve and there were great losses during transport. Edison felt, however, that DC voltage was less dangerous, and he had laboratory animals electrocuted to prove his point. Tesla's practical arguments were at least for the time being the deciding factor. Since then, however, great advances have been made in DC technology. AC - Alternating Current – The flow of electric charge periodically reverses direction. An electric charge would for instance move forward, then backward, then forward, then backward, over and over again. DC – Direct Current – The flow of electric charge is only in one direction. PFC - Power Factor Correction - Technically a three phase PFC rectifier is the best choice to interface a DC system with the utility grid. It provides a controllable DC voltage and also a reduced total harmonic distortion (THD) and improved power factor at the utility grid interface. These features are especially important because of the vast scale of the rectification process (i.e. in every dwelling). RCD – Residual Current Device - an electrical wiring device that disconnects a circuit whenever it detects that the electric current is not balanced between the energized conductor and the return neutral conductor. A fault that occurs before the protective devices at the DC side (seen from the AC side) can be dangerous. Therefore a circuit breaker and a RCD should be installed at the AC side. VFD - Variable Frequency Drive - A type of adjustable-speed drive used i nelectro-mechanical drive systems to control AC motor speed and torque by varying motor input frequency and voltage. Run on direct current in some applications such as common DC bus or solar applications, drives are configured as DC-AC drives. Facebook built its new Prineville, Oregon datacenter around a DC infrastructure. Facebook is sharing its learnings through the Open Compute Project. Other DC converts include JPMorgan, Sprint, and Bank of America. SAP also recently redid its Palo Alto headquarters to take DC. Retrofitting the data center to run on DC power largely revolved around installing a rectifier that can convert high voltage AC power from the grid into high voltage DC to run computers and storage equipment -- cost $128,000 and saves $24,000 a year. In the latter part of 2010, IBM, Hewlett-Packard and the other major server vendors have agreed to produce servers that can accommodate direct DC power. Power supply companies also signed on in the last few months. 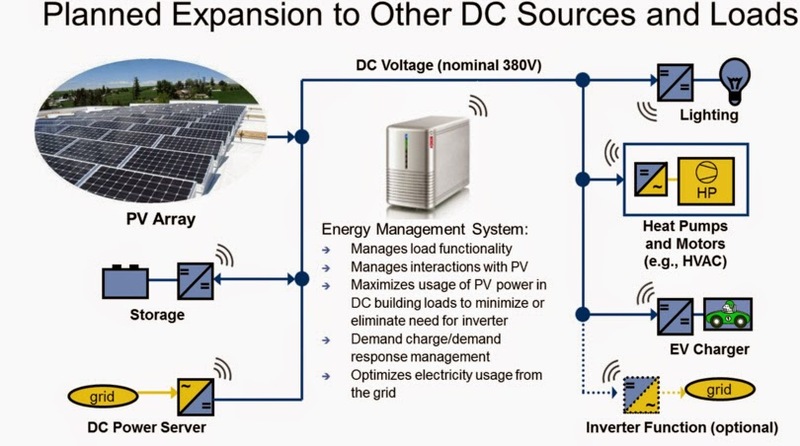 Assuming local storage and electricity generation at the end-user level, from sources such as solar cells arrays, the question is whether a complete DC voltage distribution system is technically and economically feasible. This would make the untold numbers of small transformers with rectifiers (only 60 to 70% efficient) obsolete. Since smart devices and appliances operate on DC, a power system of the future may incorporate DC currents to eliminate the unnecessary energy and reliability loses. Simplified Renewable Power Integration - Renewable solar energy technologies also naturally produce DC power. Solar photovoltaic panels typically produce DC electric energy of relatively low voltage (up to 48V). In this context, developing a Low Voltage local DC power bus could be a valuable addition to the residential power systems.. Such power bus will allow eliminating duplicate AC/DC energy conversion and also increase the safety due to lowering the outlet voltage. In addition to PV, direct current is produced by almost all new sustainable energy sources, such as, fuel cells, batteries, and others. 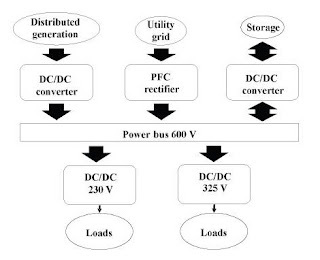 If these sources are connected to the existing 240 VAC distribution network, extra energy is required to convert the direct current into alternating current, and when the energy is to be used it must be converted back to low voltage direct current resulting in poor overall efficiency. Data Center Capital Savings - DC datacenters require 25 percent to 40 percent less square footage than their AC counterparts, largely because computer equipment can connect directly to backup batteries. Simplified Electronic Equipment - Much of the hardware in the digital equipment and appliances we buy today exists just to invert and condition the incoming AC and its imperfections to the smooth direct current that the digital equipment requires. Electric Motors - The use of variable-speed motors of all sizes which use DC has increased tremendously. Small variable-speed motors could be connected directly to this DC network. DC Appliances - The numbers of appliances in households, offices and industries that run on low voltage direct current has exploded in recent years. Examples include 12-volt halogen lighting, energy saver lamps, telecommunication and computer equipment and cordless/rechargeable devices and tools. The vast majority of devices used in households only require low power (these can be connected directly to the low voltage DC system) or high power during a short period of time (examples include a mixer or a microwave to heat ready-to-eat meals). These devices can be supplied from a connected battery system that provides temporary power. Batteries - Storage of electricity, in batteries, mobile phones, security systems and cordless tools for example, also requires direct current as an energy source. Space Requirements - A DC system often requires less space than a system with transformers, which are required for an AC system. Transmission Efficiency - When DC is used more power can be distributed via the same cables and wires. This means more efficient use of the network. Cost – Because it is non-standard, DC wiring is more expensive than conventional wiring. KEMA has assessed whether a low-voltage (parallel) DC network can be installed in homes, for both newly constructed and existing homes. The conclusion of this study was that it is already feasible using available conductor strips. However the concept strongly leans toward the classical design of electrical installations including the use of switches for the 12V halogen lighting instead of intelligent remotely-controlled converters. Considering that this 50 VDC system is partly a replacement and expansion of the existing AC installation, the costs of the home electrical network is approximately 50% higher and about $10,000. Safety - To use DC voltage safely without specific insulating precautions, the voltage must not exceed 50 V and provisions must be made to prevent short circuit. Protecting a DC installation is different from AC protection. Breaking a DC current is more difficult than breaking an AC current. Simple electromechanical residual current protective relays cannot be used. The grounding arrangement is an open question. High Power Consumption – High power consumption for a long period of time such as a dishwasher, dryer or an air- conditioning unit still require a connection to the traditional AC socket. System Dynamics - When designing a DC distribution system the dynamics of the system voltage in the face of load variations should be considered. Contrary to the AC system the DC system is not backed up by a quasi infinite utility grid. Load variations have to be compensated for by the various converters that make up the system. 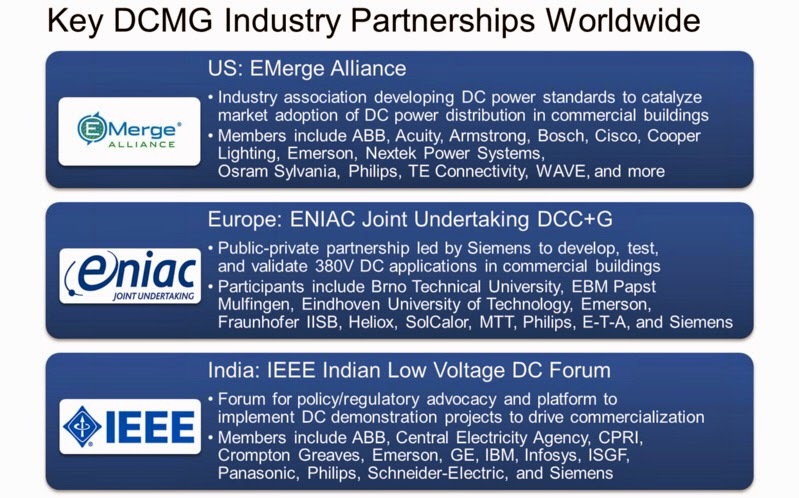 International Voltage Agreements - Internationally, agreements will have to be made about the DC voltage level. This is necessary to ensure that various countries do not select different voltage levels, which would prevent the establishment of an international standard for equipment and would lead to the need for a whole new range of adapters. Intelligent Appliances – The industry has to develop appliances that are equipped with intelligent, remote- or computer-controlled, highly efficient electronic converters (interfaces) that detect the voltage present and automatically adjust and optimize their settings. ABB (NASDAQ: ABB) In May 2011, ABB took a controlling interest in Validus DC Systems, Brookfield CT, which provides direct current power infrastructure for data centers instead of alternating current. ABB has always been in the high voltage DC business, and investing in the Brookfield, CT-based Validus helps them fill out their offerings and make a stronger play in the $24 billion market for telecommunications and data center power infrastructure. On May 30, 2012, ABB and Green, one of the top information and communications technology (ITC) service providers in Switzerland, announced the official opening of Green’s new Zurich-West data center expansion based on direct current (DC) technology. Green’s facility, which employs HVDC-capable HP servers, is the most powerful application of DC in a data center to date. Performance tests showed that Green’s new power distribution system is 10 percent more efficient than for comparable alternating current (AC) technology. In addition, investment costs for the system were 15 percent lower than for an AC system. The Alliance’s mission is “developing standards leading to the rapid adoption of DC power distribution in commercial buildings.” The standards would help eliminate much of the inefficient conversion of AC to DC between power sources and digital devices. The Alliance states that this will also facilitate the use of the most up-to-date, energy efficient products and controls by easing their installation. General Electric (NYSE: GE) - Announced in March 2011 it has signed an agreement to acquire privately-held Lineage Power Holdings, Inc., from The Gores Group, LLC. Lineage Power is a leading global provider of high-efficiency power conversion infrastructure technology and services for the telecommunications and datacenter industries. The deal will open the door for GE Energy technology to be deployed in the $20 billion per year power conversion space, where the demand for reliable, high-quality power is driven by the growth in cloud computing and mobile internet voice, video and data applications. Lineage Power had revenues of approximately $450 million in 2010. The transaction is valued at approximately $520 million or eight times enterprise value on 2011 EBITDA basis. The deal is expected to close in the first quarter of 2011, subject to customary closing conditions, including receipt of regulatory approval. Lineage Power is headquartered in Plano, Texas, and has nearly 2,300 employees, with manufacturing operations in China, Mexico and India. Nextek Power Systems, Detroit, MI - Develops equipment for running data centers or appliances in conventional buildings on direct current instead of alternating current. It is working with Johnson Controls, Armstrong World Industries and others in the Emerge Alliance on a lighting system that essentially does away with wires. Instead, low voltage DC is carried to lights through the metal grid of the building's dropped ceiling. As a result, installing, or moving, a light merely involves bolting it to the pre-existing ceiling structure. In March. 2012, at the Haixi International New Energy Industry Expo and Forum, Xiamen University, Nextek Power Systems, People Power Company, Canadian Solar, Intel Corporation and Lawrence Berkeley National Laboratory (LBNL) announced a ground-breaking alliance to construct and manage direct-current microgrids at the School of Energy Research in Xiamen University (SER-XMU). This microgrid will become operational this year and will make Xiamen University China's first direct-current powered commercial building, and will serve as a global showcase for distributed direct-current microgrid innovation and commercialization. Nextek Power Systems will introduce the first Direct Coupling® Microgrid in mainland China that will manage and support diverse energy loads such as direct-current lighting, air conditioning, data centers, electrical vehicle charging and building plug loads. People Power Company will provide its award-winning, cloud-based energy management, control and behavioral analytics applications that will enable building managers to control and manage buildings loads. 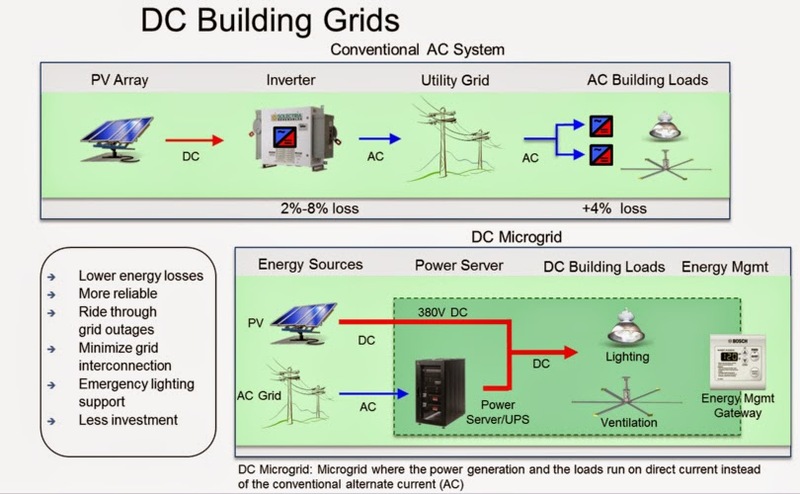 LBNL will develop methods and algorithms for the optimal equipment choice and operation of direct-current microgrids. Canadian Solar will provide customized solar panels for this rooftop solar system and Intel will provide technical expertise and advise on this research. Redwood Systems - Fremont, CA - Replaces lighting wires and regular light bulbs with low voltage wires and LEDs. Low voltage can't power regular bulbs, but it can be used to power light emitting diodes, or LEDs, in part because LEDs only consume 7 to 12 watts of power. Suddenly, you have a network in your ceiling that every light, smoke detector and other device can link into. The company, has received money from Battery Ventures and others. Founders hail from Grand Junction Networks, the Fast Ethernet pioneer turned gold mine for Cisco when acquired in 1995. Validus DC Systems- Brookfield, CT - Makes DC power systems to reduce data center energy consumption, says its equipment curbs utility bills, but the real savings come in reducing the real estate needed for data centers. Leonardo Energy - Why not using DC at residential level?